Free outdoor arts festival Fuse Medway Festival is this year presenting a strong and innovative programme of circus, aerial shows and dance alongside its usual mix of street theatre, visual arts and music. Acts include urban dance, physical theatre and aerial spectacular as well as comedy, slapstick and cabaret. The festival’s programme includes, among others, masters of aerial theatre Wired, breaking phenomenon Southpaw Dance Company and local act Black Eagles, who learnt their acrobatic skills aged 6 on the streets of Dar-Es-Salaam. 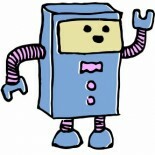 Creatabot’s very own art vending machine CreataboX will also be there all 3 days! Circus skills, parkour and dance combine in a new piece for 2014 by C-12 Dance Theatre. Following the runaway success of Trolleys in 2012 and 2013, C-12 has created a captivating new high-octane piece – Market Stall – which uses movement in, around and on top of a fully-functioning stall to inspire and delight its audiences! In a re-imagining of Goethe’s Faust Southpaw Dance Company continues to redefine the vocabulary of Breaking. In the setting of the Speakeasy Faust is manipulated to both comic and tragic effect, into a deal with the devil where his very soul hangs in the balance. Faust features a unique fusion of world-class breaking and Lindy Hop, Charleston and swinging big band music of the roaring 20s. Makers of dance theatre Dante or Die and Peut-etre Theatre Company have joined forces to create a brand new outdoor ‘dance-theatre mini-gig’ – CLUNK – specially for the under-5s and inspired by the absurd children’s poetry of Russian Daniil Kharms. The crazy stories are interpreted through Balkan music, song, imagery and movement. Acrojou Circus Theatre blend street theatre, promenade and circus and in Frantic they draw heavily on the circus traditions of wheel and aerial acrobatics. The show examines our dogged devotion to work and is one man’s journey to change his relationship with the rest of the world. In addition Fuse’s artistic director, Megan Donnolley, has programmed a new and beautiful romantic aerial show from Circle of Two, acrobatics and energetic dance from Black Eagles, the multi-talented performers, actors, jugglers, unicyclists and comedians Garaghty and Thom, eccentric clown and slack-rope dancer from Chicago George Orange, the wonderful madness of Cocoloco’s cabaret and street theatre with a twist and the equally zany young Flemish Collectif Malunés with their cocktail of teeterboard, flying trapeze and Cyr wheel. This entry was posted on 08/05/2014 by Creatabot in Creative and Art Events and tagged Black Eagles, dance theatre, street theatre.